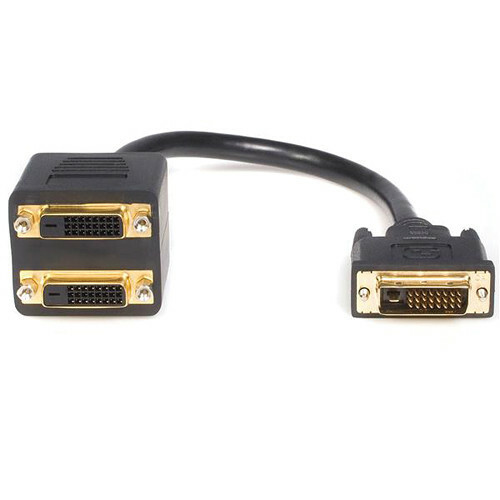 The 1' black DVI-D Male to Dual DVI-D Female Video Splitter Cable from StarTech allows you connect two DVI-D monitors/displays, or projectors to a single DVI-D digital video output port on your computer. It is suitable for use with LCD TVs, LCD projectors, plasma TVs, HDTV and DVD players, and set-top boxes. Box Dimensions (LxWxH) 6.5 x 4.0 x 3.5"
Does the Startech splitter support 2560x1080 resolution? Should work but my computer dvi video card did not have enough power to use splitter.